Apple's all-new Photos app stole the spotlight when OS X 10.10.3 was released earlier this week, but the update brought a host of backend upgrades to bring parity between software and cutting edge hardware. One of the more interesting additions is NVMe, a highly optimized PCIe-based protocol that promises faster SSD performance than current AHCI (Advanced Host Controller Interface) implementations. According to the protocol's webpage, NVMe is a register interface, command set and feature set developed "to unlock the potential of PCIe SSDs now and in the future, and standardize the PCIe SSD interface." 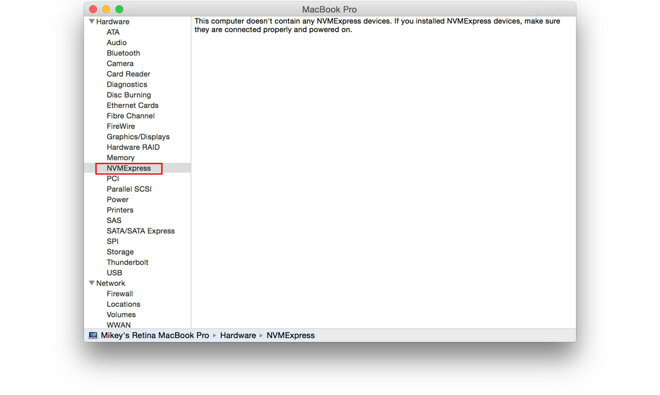 After updating to OS X 10.10.3, the new capability shows up in the hardware section of a Mac's System Report, though owners of older MacBook models are unlikely to see supported drives. The addition was spotted by MacRumors on Saturday. Developed by an industry consortium including major industry players like Intel, NVMe is meant to replace aging AHCI technology, which was designed to maximize performance in systems using spinning hard drives. As noted by AnandTech, NVMe is optimized for lower latency operations afforded by solid state media, or non-volatile memory. 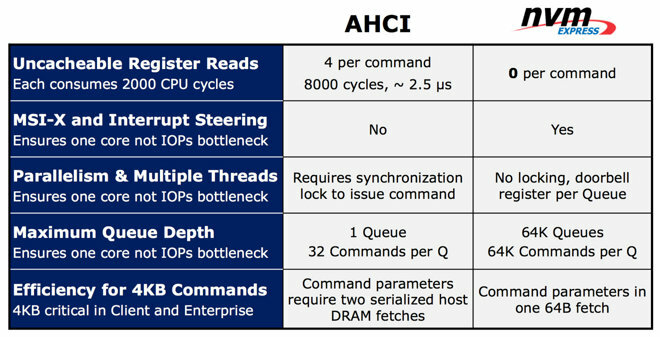 Compared to AHCI, NVMe reduces latency by 50 percent. For example, Intel puts latency overhead in SCSI/SAS systems at 6 nanoseconds at 19,500 cycles, but quotes NVMe at 2.8 nanoseconds at 9,100 cycles (PDF link). Further, NVMe is designed to scale over the next decade, a lifecycle comparable to AHCI, which was introduced in 2004. And since Apple has been using the PCIe transport protocol since 2011, the company is in a good position to expeditiously roll out support across the entire Mac lineup. The first Mac to take advantage of NVMe speed —and accompanying power savings —is Apple's newly released 12-inch MacBook with Retina display. Apple pulled a similar move when it introduced PCIe with the 2011 MacBook Air, a laptop designed with an eye on efficiency, not speed.